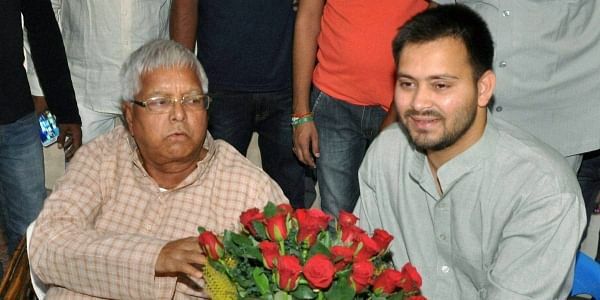 RJD chief Lalu Prasad Yadav openly backed his younger son Tejaswi Yadav’s suitability for being declared the party’s chief ministerial candidate in Bihar’s next Assembly polls. PATNA: Disregarding the rising voices of dissent in RJD, party chief Lalu Prasad Yadav on Friday openly backed his younger son Tejaswi Yadav’s suitability for being declared the party’s chief ministerial candidate in Bihar’s next Assembly polls. While many in RJD had expected that Lalu’s seal of approval would put an end to disagreements on the matter, the rift widened when senior leader and party national vice-president Raghuvansh Prasad Singh declined to endorse the party chief’s views. After party veteran and ex-minister Abdul Bari Siddiqui, Raghuvansh is the second top RJD leader to question Lalu’s desire to make Tejaswi, Bihar’s next chief minister in an RJD-Congress alliance government. “Is there any other candidate?” asked Lalu when journalists asked him about RJD state president Ramchandra Purve announcing Tejaswi as the party’s CM candidate for the 2020 Assembly polls. “ The people will choose him as their leader. Who can stop him?” he added. But Raghuvansh Prasad Singh, one of Lalu’s trusted associates and a prominent upper-caste face in RJD, aired his disagreement to Tejaswi’s candidature. When asked if he was okay with Tejaswi becoming CM, Raghuvansh shot back: “Why should I say it is okay? It will be decided when the time comes”. Meanwhile, RJD’s ally Congress chose to keep quiet on the issue.